Back in August, trainer Kaili Graf and her rescue horse Soby were gearing up for the 2015 Western Dressage World Championships in Tulsa. As it turns out, all their hard work and dedication paid off last month with five overall top 10 finishes and two top five placings. As for the specific placings, Kaili and Soby earned 9th in Western Dressage Suitability, 5th in Open Equitation on the Rail, 5th in Basic Freestyle, 6th in the Introductory Level Test Four, and 8th in the Level One Freestyle. The dynamic duo of Kaili and Soby won’t be relaxing for long, though, as she is already scheduled to teach some Western Dressage clinics in January. 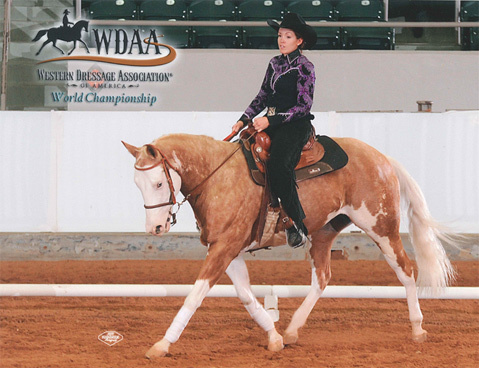 For those interested in learning about Western Dressage, more information is available on Kaili’s website at SpeakEquine.com/clinics.